In this eighteenth century style both the flat and the meter wheel were used. But in each case only an edge of the wheel was engaged, producing a shallow cut that is quite distinctive. Because the glass blank was presented to the cutting wheel at an angle, the cut was asymmetrical and sometimes of lunar shape. Although seldom used by cutters during the past 150 years, it was employed to a limited extent at T. G. Hawkes & Co. for a few years during the 1910s and 1920s when there was a revival (“reproduction”) of so-called Old English and Anglo-Irish cuttings (compare Sinclaire and Spillman 1997, illus. 338). This technique, however, is often used by engravers who seek to cut shallow, stylized leaves. These engraved, or shallow-cut, leaves can be traced back to the classical “husk circuits” often edge-cut on eighteenth century table ware. 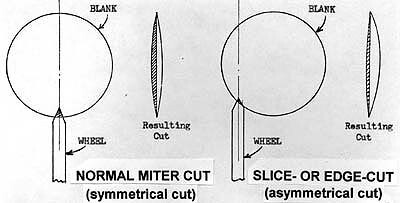 Comparison-sketch of miter and edge or slice cutting, showing the resulting asymmetrical cut produced by the latter technique (after Elville 1960, p. 179). Few motifs in this group have been named, and only a scattering of descriptive terms such as “large, shallow diamonds” and the “eye-lid” motifs appear in the literature. Interestingly the large, shallow diamonds required twice the number of passes over the cutting wheel as did the smaller “relief” diamonds cut later with the glass blank held perpendicular to the miter wheel. As a result, pieces cut in this old style are easily identified. To test whether a large, shallow diamond has been cut using edge or slice cutting, run your finger-nail across the “split” that defines the diamond. Your finger-nail will catch on a “step” that results from the fact that the two sides of the cut were made independently. It is impossible to cut adjoining cuts to absolutely identical depths, and, as a result, a tiny step is formed. Thorpe (1935, p. 215) argues persuasively that the large, shallow diamond (a.k.a. “the broad relief style”) is a mirror-grinder’s motif — “a bevel-edged mirror reduced to the nth [degree]” — introduced by the English grinder Thomas Betts in the middle of the eighteenth century. Thorpe thus regarded this motif as an English, rather than a German, invention. In the example illustrated here, a later date is suggested in light of the accompanying star-cut base. This latter figure is placed on a cut, circular boss, and its rays show the tiny step that indicates that each ray was double slice cut. Plate or tray. Colorless, lead glass. Completely cut except at the rim (possibly left uncut to accept a silver mounting). Band of slice-cut large, shallow diamonds bordered with flutes. Early miter-cut 24-pt star base. English, late eighteenth century. Sold for $50 in 2007. D = 8.75″ (22.2 cm), H = 1.25″ (3.2 cm), wt = 1.25 lb (0.5 kg). Apparently, during the nineteenth century the miter wheel, with an apex angle much greater than 90 degrees, was sometimes used to cut large, shallow diamonds in imitation of the earlier style. No step can be felt on these pieces. This supposition is supported by observations that the blanks used often had poor color, probably an attempt to imitate the color of the glass of the previous century. Ironically, authentic eighteenth century lead glass is often of very good quality. 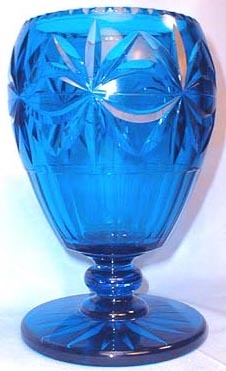 Fake cut glass is not exclusively a twentieth century phenomenon! Before the two-piece butter dish became commonplace on Victorian tables, three-piece “butter coolers” were popular. Butter itself was considered an appropriate accompaniment to the wine that was served after dessert. The Frenchman Francois de la Rochefoucauld, described dining at a well-to-do English home in 1784 where, after the main courses, which took “four or five hours,” the table-cloth was removed and the table prepared for some serious drinking: “On the middle of the table is a small quantity of fruit, a few biscuits (to stimulate thirst) and some butter, for many English people take it at dessert.” (as quoted in Warren 1981, pp. 246-7) The butter would have been stored in a cool place in wooden, or perhaps ceramic, tubs. But when brought to the table, gleaming under candlelight, it would have been transferred to a butter cooler, most likely elegantly cut in the situation described above but unadorned when used in more modest circumstances. Several years ago the writer visited a consignment shop in Barrington, RI and witnessed the clerk about to exhibit a three-piece cut glass butter cooler. Wasting no time, he quickly inspected the item and found it little damaged and displaying, in abundance, that type of cutting we have identified as edge- or slice-cut. The price tag that read “three pieces of glass, $12” did nothing to discourage an immediate purchase. But a major mystery presented itself: Could such an item have survived from the days of de la Rochefoucauld? If so, who made it? Or could it be a more recent “reproduction”? The butter cooler from the consignment shop. Colorless, lead glass. Slice cutting showing the “eye-lid” motif. Probably Continental, date uncertain. H= 7.25″ (18.4 cm), D = 7″ (17.8 cm), wt = 2.75 lb (1.5 kg). Minor chips. Sold for $100 in 1991. There is a common belief that certain styles of cutting indicate certain dates. 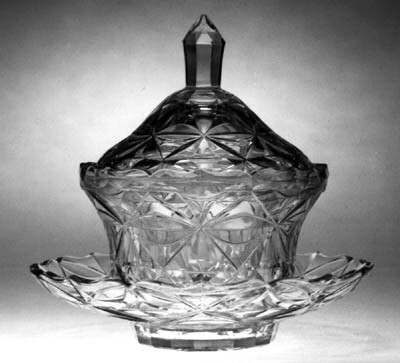 It is true that a certain style may indicate that a glass was not made before a certain date, but a style, once introduced, was constantly copied, and the copying is still continued (Powell 1923). Indeed, “the copying is still continued,” is well-illustrated by this vase cut by T. G. Hawkes & Company, probably during the 1920s (Sinclaire and Spillman 1997, p. 102). The blank is number 3223. It is solid blue and has a height of 8.6″ (21.8 cm). The “eye-lid” motif is featured (Image: Internet).